The colour you choose for your accent wall is a matter of taste; it is your home, after all, so it should suit your style. Carefully consider your choice before you make the leap. You want a colour that will invite people in, not send them running for the hills. These colours are our top picks for creating an accent wall that will make your whole room shine. Talk about bold: Red has been known to stimulate appetites, so it works well in a kitchen or dining area. 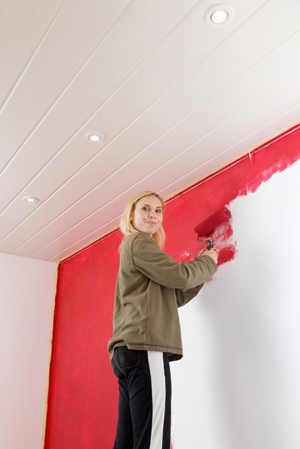 Choose a bright shade of red in a high-gloss colour, and leave the rest of the wall as blank as you can. The colour itself will serve as artwork, so don’t clutter it with lots of pictures and paintings. Because red is a lot to handle on its own, don’t add a lot of other colours to the room. Something as simple as black, white or yellow is all you need; anything else may start to look cluttered. When we say orange, we don’t mean the colour of the fruit. The perfect shade of orange for an accent wall is a shade that’s closer to terracotta. It’s warm and comforting, making everyone want to come in and have a seat. Mix it with browns, yellows and neutrals for a pop of colour that’s noticeable but not overpowering. Everyone loves a little sunshine, so bring some to your room with a yellow accent wall. Choose a wall that doesn’t get a lot of light and paint it a bold shade of yellow that’s guaranteed to brighten the space in an instant. Deep browns are sophisticated and classy but still super-comfortable. The problem is that you just can’t paint a whole room brown without creating a cave-like feel. Instead, go with a lighter shade for the rest of the room and use a deeper brown on your accent wall. No colour is more calming than blue, but too much of it can make a space feel cold and uninviting. Choose a shade of blue with undertones of silver or grey, and paint just one wall that colour for a look that calms –- but not too much. Having a hard time picking a colour? Try the same colour as the rest of your walls, just two shades darker.